Whether you are new to the area, recently adopted a new pet, or if your needs for veterinary services have changed, it’s a good idea to find a quality Southeastern Massachusetts veterinarian hospital before you need it. Annual veterinary check-up and dental care services, as well as emergency veterinary care in Massachusetts, are all essential for helping to keep your pet happy and healthy. Finding the best solution for you and your pet is an important part of providing quality services and care. You wouldn’t take your kids to “just any doctor,” and you likely wouldn’t take your beloved pet to “just any veterinarian” either. What Makes a Great Veterinarian? There are certain qualities of all professionals that make them stand out from the crowd. If your pet requires advanced dentistry in Dartmouth and the surrounding area, then you should seek a veterinary clinic that provides this service. If your pet has a specific condition or if you have an exotic pet that can be difficult to treat, you need to make sure that the Southeastern Massachusetts veterinarian you choose will be able to provide these services. Beyond these basic qualifications, there are other things that you should look for when interviewing veterinary clinics for your pet. 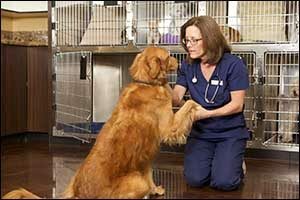 Communication Skills – While this can be a personal preference, it is vital that you be able to communicate well with your veterinarian whenever you come in for a veterinary check-up, treatments, or other services. A great veterinarian will have excellent communication skills and should be able to talk effectively with pet owners to explain exactly what the pet requires in the way of treatment or preventive programs. Compassion and Caring – You wouldn’t want to visit a doctor that had no bedside manner and the same holds true for veterinary care in Massachusetts. Finding a vet clinic that has doctors who genuinely care about animals should be of the utmost importance in your search. You want a team that cares about their pet patients and pet owners to feel confident in the services you are receiving. Dedication and Education – It is a wonderful thing to find a veterinary team that stays on top of the latest techniques, technology, and treatment options for pets. If you want the best services available for your pet’s care, it is crucial to find a Southeastern Massachusetts veterinarian who stays up on training, education and is dedicated to finding new ways to help pets stay healthy and treat common veterinary conditions. Time Management Skills – We have all experienced a professional services appointment where the physician is always late or appears scattered and distracted. Good time management skills are necessary for all types of services, but especially when it comes to a veterinary check-up or treatment for your pet. While emergencies can occur that might increase your wait time, you don’t want a vet that is always late just because they can’t properly manage their time. Knowledge and Experience – A great veterinarian will have a comprehensive understanding of all the behavioral issues, common ailments, and anatomy of many different kinds of animals. They will also have a lot of experience working with animals to help them make quick decisions when it counts the most. Emergency Care Services – Whether your pet has been in an accident or is experiencing serious and severe symptoms, it is essential to get them to veterinary care in Massachusetts that is trained, experienced, and prepared to handle emergency situations. Dental Care and Services – Advanced dentistry in Dartmouth can be hard to come by for pet patients. If your pet suffers from serious dental issues, which can sometimes be life-threatening, make sure to choose a clinic that offers advanced dental treatment beyond basic brushing and cleaning. Dental surgery and other skills can be significant to the ongoing health and the well-being of your pet. Since 1975, we have provided comprehensive and quality care for pets and pet owners in the SouthCoast region. Our Southeastern Massachusetts veterinarian team works closely with local pet owners to offer a variety of essential services, including veterinary check-up and preventive care, advanced dentistry in Dartmouth, and emergency veterinary services. If you would like to learn more about our team or the services that we provide, give us a call at 508-996-3731. We can answer any questions that you might have, set up an initial consultation appointment, or offer details on the options available for veterinary care in Massachusetts at our animal hospital.